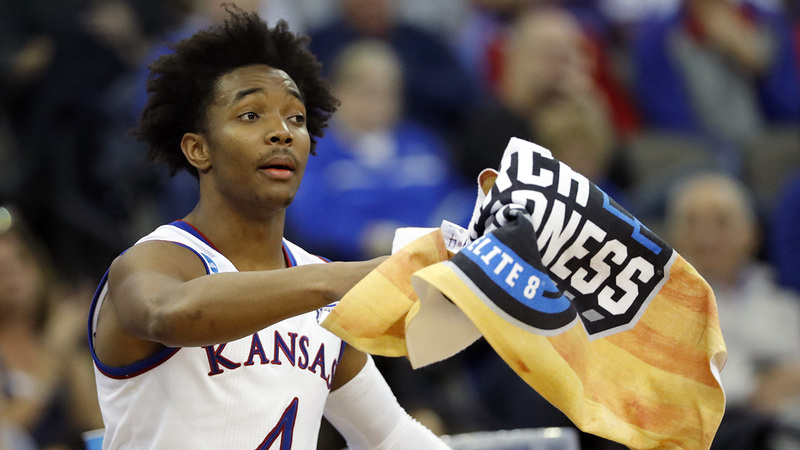 RALEIGH, NC (WTVD) -- Devonte' Graham and his University of Kansas teammates are preparing for their biggest NCAA tournament challenge yet - a showdown against top-seeded and favored Villanova on Saturday in the Final Four. And back in Raleigh, his former teachers and other administrators at Broughton High School and Daniels Middle School are making sure Graham knows a lot of people are cheering him on. In a YouTube video, various teachers and staffers gave words of encouragement and fondly recalled watching Graham grow from a "silly freshman" in math class to a "great kid." Other messages lauded Graham not only for his basketball excellence but for the pursuit of his bachelor's degree. Others recalled Graham as a leader, even at Broughton. He's certainly been a leader at Kansas, averaging 17.2 points per game and 7.2 assists during this memorable senior season. And one teacher even said, "You've actually got me watching basketball, which is a miracle. We're having so much fun here cheering for you!" Graham is aware of the video, as he retweeted it on Twitter.